Together with coarse crushers, this PF series is capable of crushing the minerals and rocks with breaking strength up to 320Mpa.It is widely used in highways,water conservancy, airport,civil construction and high-rise buildings. 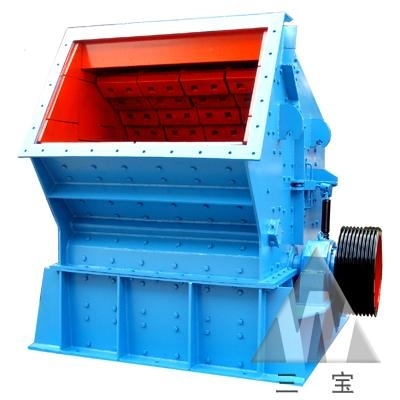 The impact crusher crushes materials with impact force.When the matetial enter the blow bar area,they are crushed due to high-speed impact of the blow bar and are thrown to the impact plates on the rotor for sedondary crush.Then the materials will be shot back to the blow bar again for the third crush. This process repeats until the materials are crushed to the required size and discharge from the lower part of the machine.The size and shape of the finished powder can be changed by adjusting the gap between the impact rack and rotor support. The machine employs self-weigh security device in its back frame.When other objects enter the impact cavity,they will be force out the machine by the impact rack in the front and back of the machine.